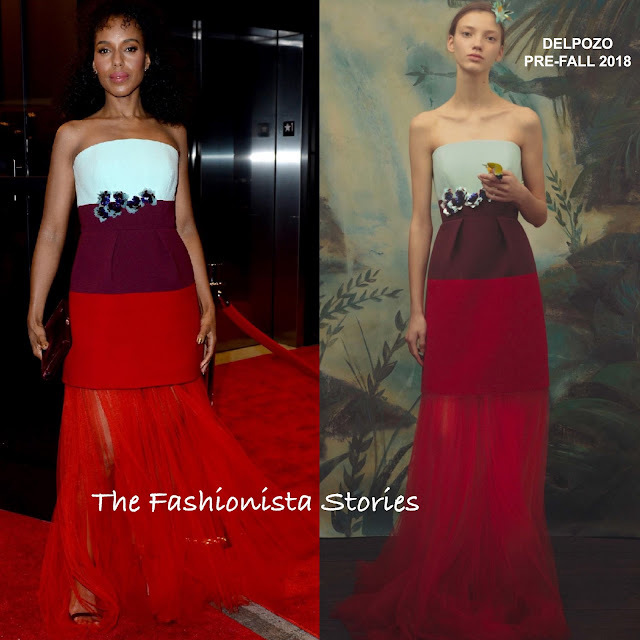 Following her 'GMA' appearance, Kerry Washington posed on the red carpet at the Lehman College 50th Anniversary Celebration & Leadership Awards Dinner at The Ziegfeld Ballroom last night(April 11th) in New York City. Turning to DELPOZO, she wore a PRE-FALL 2018 strapless color-block layered dress which featured a mint, burgundy & tomato red embroidered bodice and a tomato red floor length skirt. Beauty wise, she rocked her natural curls in a teethed half-up half-down style and minimal make-up. A ROGER VIVIER clutch and burgundy stone earrings finished up her look.